Over the past three years, profitability at Ezra Holdings has had a choppy ride. One of its offshore support vessels was caught in rough seas as management grappled with what it termed the transformational acquisition of its sub-sea business in 2010. But Ezra's group CEO, Lionel Lee, maintains a composed demeanour in the face of criticism of his controversial yet bold strategy for the group, for which less than a handful of analysts are now rating the company as at best a "neutral" while most have rated it a "sell" or "underperform". For one thing, the company's share price continues to defy equity analysts' low targets of between $1 and $1.30 per share, and traded to Friday's close near the year's high at $1.44. For another, Mr Lee believes most analysts nowadays have a short three to six months' view, while Ezra's subsea acquisition (now under Emas AMC) is part of management's 10-year master plan for the group. "The only thing constant in our business is change, that's what I tell my people," says Mr Lee, dressed in an elegant grey suit. "We have to transform ourselves and to think five to 10 years from now where Ezra will be. 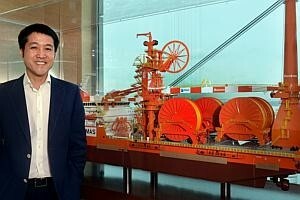 We need to think about how we can diversify our earnings stream and transform ourselves from a basic ship owner to a global offshore engineering organisation, where we are making money not only chartering our vessels but are able to combine the engineering capability with the assets to produce the final product," he shared in an exclusive interview with The Business Times. He added: "It seems like everyone who comes out with a report is looking at three to six months ... We take a view of five to 10 years down the road. You take Apple (for example) born in the 80s and it only became the most valuable company upon its IPO in 2012. If you look at Technip, from the time they started to today, it took them 40 years. So I think from the backlog we have, from zero to where we are projecting where we are going in our orderbook, we have taken a relatively short time. "And I have to thank my current management for not flinching in very difficult times. It's not only in AMC management, it comes across in Marine, we have challenges operating offshore in all divisions because we have moved our model to not only chartering the vessels but moved our model, even in energy, to provide services to go along with it." Ezra's transformation seems to be gathering momentum with its recent string of announcements of multi-million-dollar contracts for the subsea division. At the end of October, the group announced US$110 million in subsea and offshore support services contracts. Emas AMC's projects included the offshore installation of Surf (subsea umbilicals, risers and flowlines) for a national oil company as well as offshore pipeline repairs for an Asian oil major. In fact, AMC has secured US$1.5 billion in new contracts year to date, more than triple the US$400 million in 2012. "I am delighted with the steady progress that Emas AMC has made this year. Not only are we continuing our winning momentum, but we have also demonstrated that project execution is reaching a higher level of operational efficiency," he had said upon the contract announcement. "We are now beginning to see various repeat clients, which means we are gaining recognition for the good work we are doing." When recently queried by the Singapore Exchange for its sharp share price appreciation, Ezra stated that it is evaluating and in discussions on projects and proposals related to its subsea business, but clarified that there was no certainty that these discussions would progress beyond the current stage. On Oct 25, the group reported a 19 per cent year-on-year decline in FY2013 net profits to US$53.6 million. Group operating profit sank 46 per cent year-on-year to US$51 million, largely due to its subsea division losses of US$22.7 million, as the group had taken writedowns in Q3 FY2013 for some of AMC's legacy subsea projects. While analysts appear sceptical, their average FY2014 and FY2015 projected net profits at US$58 million and US$84 million, respectively, show good growth, although some like BAML and Deutsche Bank have caveats like potential execution issues and new vessel delivery delays attached. "We thought it would have taken at least 24 to 30 months to turn around so we were not far off. What we didn't plan for were the legacy projects, so that was an issue for us and that's where the gestation losses were a little bit more than we expected," Mr Lee said. Ezra had acquired AMC from Aker Solutions AS in October 2010 for US$250 million, and topped out the acquisition at a total of US$354 million after vessel and equipment purchases at the close. Mr Lee said: "Now we have executed our legacy projects and I would say our new backlog is at an all-time high. Our bid book is also at an all-time high of US$8 billion. So not only are we turning around but I think what's very important is that we have built a very strong team across the three regions of Asia-Pacific, the Americas, the North Sea and West Africa. "We think we have prepared over the past three years for the next three years of growth. The next three years look bright for us and I don't foresee any dark clouds coming across. We have a tender book of US$8 billion, actually for more than US$6 billion of that we have very little competition globally. There are basically four of us. Technip, Subsea 7, Saipem and Ezra. So we are working at it. In some areas we are seen as the third player and in some areas the fourth player." Mr Lee said that Ezra will continue to grow all segments of its business. "We will look at engaging partnerships because in our game, the projects are getting larger and larger, and no one company will be able to fulfil one particular job of US$4-5 billion on one job alone. You just don't have enough resources and assets to fulfil the needs of the oil companies going forward as the offshore oil field and gas fields are getting larger, so it's important going forward to be aware that we need to have good partnerships." Perhaps forging a few good partnerships may be the next stage in the group's plans to take on the big boys to get a fair share of the offshore oil and gas and subsea construction and services market.